I know, I know. We can’t eat donuts all day long. And we ate all of the donuts in one day. Someone had to sacrifice and experiment to make sure all those toppings were good right? So here is a quick and easy recipe that I cobbled together using Alton Brown’s Biscuit recipe as the topping. I didn’t want to make a pie crust and now that I read that the Pillsbury pie crust contains nasty artificial colorings and junk, I really don’t want to get it anymore. When does pie need Yellow #6?? (I can’t remember the exact number… but it has it in there.) The biscuits Pillsbury makes in a can contain partially hydrogenated soybean oil. Yuck. 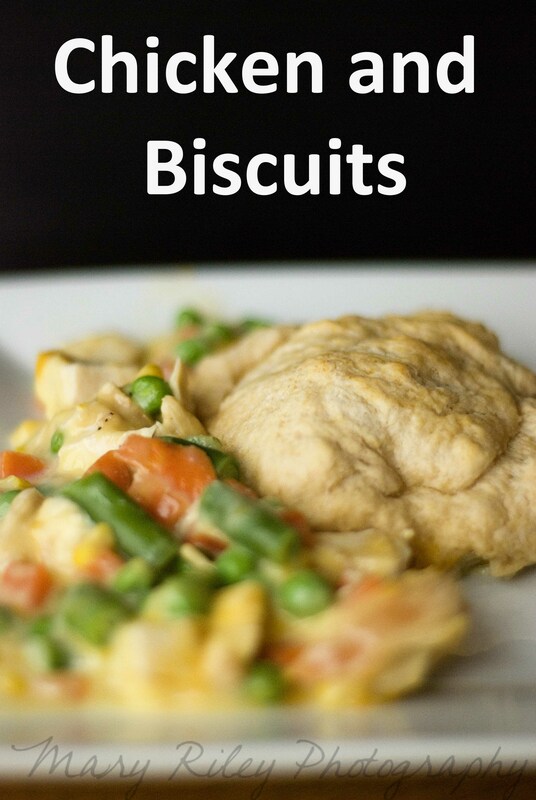 This is Chicken Pot Pie with biscuits instead of pie crust. I had some leftover cooked chicken and this baby whipped up in 35 minutes. 1. Preheat oven to 400 degrees. In a great big bowl, mix the frozen veggies, cooked chicken, cream of chicken milk, seasonings and cheese. Dump into a 13×9 pan. Bake for 15 minutes. 2. While that bakes, in another large bowl mix the flour, baking powder, baking soda and salt together. 3. Use your hands to rub the butter and shortening into the flour. Try to do this part quickly so the fat doesn’t melt. Make a hole in the middle of the mixture and pour in the buttermilk. Knead together. Gently fold the dough 5-6 times. Roll 1″ thick and cut with a 3″ biscuit cutter or cookie cutter or even a glass will work in a pinch. Reroll the dough until you have little left. 4. Now your casserole should be beeping that it is done and you put your yummy biscuits on top. Bake for 20-30 minutes. The biscuits will be light gold on top. Feel free to top with more cheese, fried onions, etc. Biscuit recipe from Alton Brown.